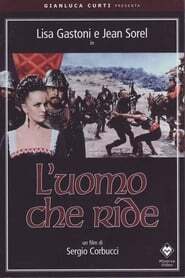 overview : A 1966 French-Italian film version made in Italy, titled L'uomo che ride, directed by Sergio Corbucci. This version features elaborate colour photography but a very low production budget. The main action is shifted to Italy and moved yesterwards in time, with the deformed protagonist meeting Lucrezia Borgia instead of Queen Anne. In this version, Gwynplaine is renamed Angelo (played by Jean Sorel). His disfigurement is represented as a single broad slash across his mouth, crude yet convincing. The story (which is attributed, in the movie credits, to the director, producer and others involved in making the film, but not to Victor Hugo) is a swashbuckler pitting the disfigured acrobat against the henchmen of the Borgias. At the end, Dea (actress Lina Sini) miraculously acquires her eyesight and Angelo undergoes surgery that completely reverses his disfigurement and renders him perfectly handsome.